Lin Chamberlain is certainly someone to be noticed. With her red hair, elaborate style, distinctive jewelry (some of which she designs and makes herself) and infectious laugh, she is easy to spot at shows. Happily married for twenty-one years, she is a professional vocalist, who occasionally sings with a dance band and the Fort Wayne Philharmonic. 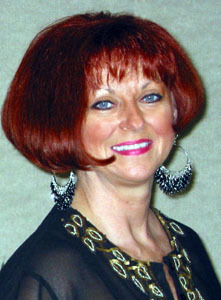 She has also been a hairdresser for thirty-three years. On a dare from her husband, Paul, she started creating her own dolls and that eventually lead to her establishing her own company known as Pookie Bears & Critters by LinLee. Lin originally started out as a doll collector, but once her husband found out how much she was spending on dolls, he challenged her to create and sell her own dolls. 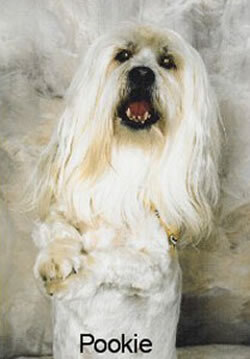 The company name came from a beloved dog, nicknamed Pookie, which was Paul’s first birthday gift to her. Lin demonstrates needle-felting during shows. Since then, Lin has been creating awesome and stunning works of art. Her early experience making unique dolls soon evolved into the bears and critters she is known for today. She has been able to pull imaginative ideas from her extensive artistic back-ground, which includes sculpture, painting and design, to make hand-sculpted, polymer-faced bears and critters. Lin is now blazing a trail in the field of needle-felting. There seems to be no limit to her imagination when it comes to her ideas. Her great sense of humor is the perfect backdrop for creating the humorous pieces that grace her exhibit tables. 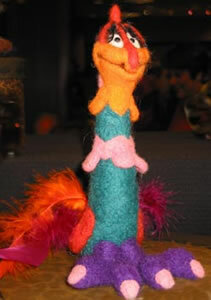 During shows, Lin likes to demonstrate needle-felting to all those who stop by her table. Of course, she makes it look easy. She feels that it is pivotal to her business because it helps her customers understand exactly how much time and creativity it takes to produce a finished piece. Her creations through the years have spanned from realistic to whimsical. Lin’s motto is, “if my critters don’t make you smile or laugh, I haven’t done my job.” All of Lin’s creations are one-of-a-kind. Since making her first doll in 1989, Lin has been featured in magazines, won numerous awards and is an active teddy bear, doll and art show exhibitor. What draws Lin to the shows is the joy she finds meeting people and the extremely caring friendships she has developed with collectors and artists. It is not surprising that her laughter can usually be heard throughout the show as she loves to laugh and hopes that her creations make others laugh too. And it is evident to all those who stop by her table that Lin is one of the remarkable reasons that people love to collect teddy bears. Lin is a natural with needle-felting, making the process look easy!